This is my 5AM Wakeup calendar month, November (minus the heading) has been my best month yet but I had some terrible night sleep on the Tuesday. One was because I had to attend a funeral and I had nightmares all night the other – just a lousy night sleep. With the exception of a slowdown alarm I do not have a “wind-down” routine to ensure that I have a good night sleep. I have noticed that my energy levels have been peaking at the wrong times sometimes and it have become a problem for me sleeping, this will be an aspect I will be looking at this month. I must emphasize that one of the prime objectives of the 5AM club is to have adequate sleep. There is no point to living the 5AM club life but walk around like a zoombie all day. Personal Productivity and well being is what this club is all about. 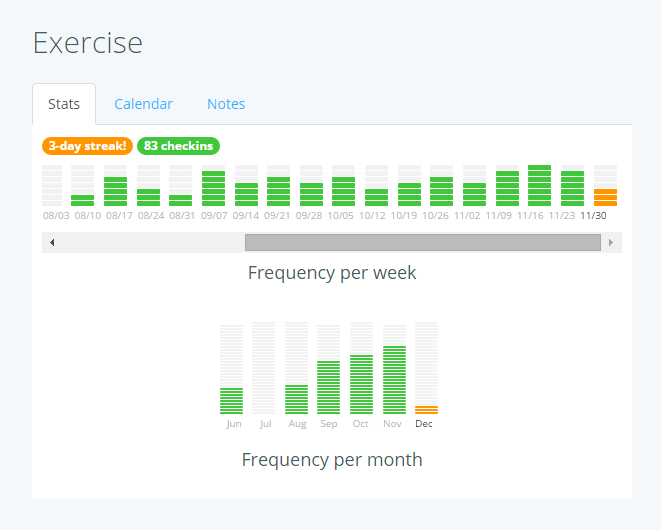 The interesting feature that Lift has is that you can see the monthly progress. At the start I was only succeeding at just over 50% in August for waking up at 5AM but with practice it has become easier on my willpower which allows the habit to start forming and the habit became more consistent. As you can see from these charts my 5AM wake ups have become consistent, I am reaching my target more consistently in each progressive month. Prior to this exercise I thought that I would wake up at 5.00AM but from experience and understanding “habit forming” it is a progressive exercise – it builds up over time. I have set goals of 22 day streaks, 44 and 66 day streaks. Getting to 22 takes effort and time.